Which Peterborough United players failed their audition and who has the X factor? Posh debutant Josh Yorwerth in action at MK Dons. Photo: Joe Dent/theposh.com. Peterborough United’s Checkatrade Trophy tie at MK Dons (September 4) was as much a mass audition as it was a competitive football match. 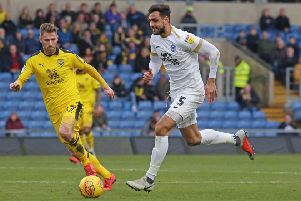 A battle of the back-up singers took place and jolly entertaining it turned out to be with Posh finding their voice in the second-half to turn a 3-0 deficit into a 3-3 draw. The suspense wasn’t over though as the home side won a penalty shootout - the Trophy’s equivalent of a sing-off - 6-5 to claim a victory of sorts. Posh right-back Darren Lyon congratulates teammate Matt Godden after his late equaliser at MK Dons. Photo: Joe Dent/theposh.com. Passionate Posh boss Steve Evans is a man who would rage at, cajole and bully officials during a family board game, but even for him last night was more about gathering information on players left on the sidelines during a rampant start to the season. Were they good enough to step up when required? They need to be as League One is a long, old slog. So what did Evans learn, apart from how difficult it is to make 10 changes to a starting line-up and retain form and fluency? An error-strewn first-half showed the boss the value of big, strong full-backs (Chuks Aneke overpowered Tyler Denton to head in the opening goal) as well as the importance of club captain Alex Woodyard. Only when he came on late in the first period for injury victim Callum Cooke did Posh recognise the value of tracking runners and making tackles - it was a shame his was the only spot-kick in the shootout that failed to find its target. Evans would also have spotted the potential of Marcus Maddison delivering crosses into the path of big Ivan Toney. Ivan’s finishing was terrible last night and yet missing a simple hat-trick of chances - twice following magnificent Maddison passes - couldn’t disguise the fact that he’s an imposing presence. Marcus Maddison in action for Posh at MK Dons. Photo: Joe Dent/theposh.com. Elsewhere George Cooper showed class in scoring direct from a free-kick to open the Posh scoring and quality in creating a last-gasp tap-in equaliser for substitute Matt Godden, but the biggest plus at Stadium MK was the surely the second-half cameo delivered by debutant Jamie Walker. Walker only trained with his new teammates for the first time the morning before this game. On the evidence of his smooth-running, neat passing, fierce shooting (he struck the inside of a post from 25 yards with a terrific hit) and expert finishing (he skilfully converted a fine cross from Denton to drag Posh back to 3-2 in the 87th minute) he won’t remain on the substitutes’ bench for long. It is a sign of these strange Posh times that a supposed ‘reserve’ team still included an apparent £600k striker, the king of the League One assists and a centre back in Josh Yorwerth described by his manager in the summer as ‘the best in League Two last season,’ but who can’t get a game ahead of a former Mansfield defender. They couldn’t stop Aneke scoring his second goal at the end of the first-half and not long after Rhys Healey has been allowed to head a set-piece unchallenged beyond Posh ‘keeper to give MK what should have been an unassailable half-time lead. Aneke’s departure 20 minutes from time helped Posh in a frantic finale which saw action in both goalmouths, but mainly the home area in front of over 500 travelling Posh fans. They paid a mere fiver to get in, a bargain once the opportunity to taunt MK supporters developed late in the piece. Posh: Conor O’Malley, Darren Lyon, Tyler Denton, Josh Yorwerth, Ryan Tafazolli, Callum Cooke (sub Alex Woodyard, 37 mins), Louis Reed (sub Matt Godden, 82 mins), Marcus Maddison, Isaac Buckley-Ricketts (sub Jamie Walker, 46 mins), George Cooper, Ivan Toney. Unused substitutes: Aaron Chapman, Jason Cummings, Siriki Dembele, Rhys Bennett. MK Dons: Stuart Moore, Ryan Watson, Ousseynou Cisse, Mitch Hancox, Callum Brittain, Baily Cargill, Oran Jackson, David Kasumu (sub Aiden Nesbitt, 84 mins), Finn Tapp (sub Charlie Patterson, 84 mins), Rhys Healey, Chuks Aneke (sub Sam Nombe, 68 mins). Unused substitutes: Wieger Sietsma, Brandon Thomas-Asante, Liam Sole, Dylan Asonganyi. Goals: Posh - Cooper (56 mins), Walker (87 mins), Godden (90 + 3 mins). MK Dons - Aneke (7 mins & 45 + 2 mins), Healey (33 mins). Cautions: Posh - Woodyard (foul). MK Dons - Kasumu (foul), Jackson (foul).